A solid resume is important, but rarely is that enough to get you through the door with a prospective employer. If you make it past the first round of recruitment, often you'll also be asked for a phone interview. Your resume, career notes, research on the company, and anything else that you think will come up in the interview, should be close at hand. When you're on a phone call, the interviewer can easily pick up on the fact that you've left your desk to rummage through a filing cabinet, and the sound of you frantically trying to find what you need will not leave a good impression. It will only make you come across as disorganized and unprepared. For any remote job interview, privacy is paramount. You do not want to start the conversation only to have your four-year-old come in and ask for help going to the toilet. You also don't want to have ambient background sounds making it hard to concentrate, such as loud music, heated conversations, or video games. So, if you live with other people, let them know the importance of the interview, and that you need them all to be quiet for the next 30 minutes or so. If you can, take the call in a place that is always quiet — a home office, a bedroom, or even the basement. And if you lock the door, put a sign on it saying why it's locked. You do not want your family or friends hammering on the door because they want your attention. Also, don't interrupt yourself. It's unprofessional to leave the interview after 15 minutes because you desperately need to use the restroom. Take care of that before you even pick up the phone. One of the biggest problems with a phone interview is talking over the interviewer. Since you don't have visual cues to work with, you have to rely on natural breaks in the conversation. For some people, this comes easily. For others, it's not as intuitive. You should hold practice conversations with your family and friends to perfect this. You should also be aware of how much you tend to hog the conversation. In person, with your gestures and enthusiasm, it can come across as great passion for the job. But on the phone, you can be seen as a chatterbox who is only interested in talking about yourself. Take your lead from the interviewer. Give answers that are complete, without being verbose. If the interviewer starts to talk while you are talking, they will probably have a question directly related to something you have just said. Pause, and let them get their question out. Remember, most communication is visual, and you do not have that going for you here. Listening is now your most vital sense. It's tempting to sit there in your most comfortable clothes, perhaps wearing your favorite T-shirt with the holes and the spaghetti sauce stain. This is a huge mistake that many people make when getting ready for a phone interview. Sloppy attire may not be something the person on the phone can see, but your attitude can change dramatically according to what you're wearing. If you dress in lounge attire, you may inadvertently come across as more lax, and less professional. Now, this doesn't mean you have to wear a suit and tie, or spend an hour getting your hair and makeup perfect. But you should make the effort to be clean, presentable, and in clothing that gives you a sense of pride and professionalism. Don't roll out of bed 10 minutes before your interview. 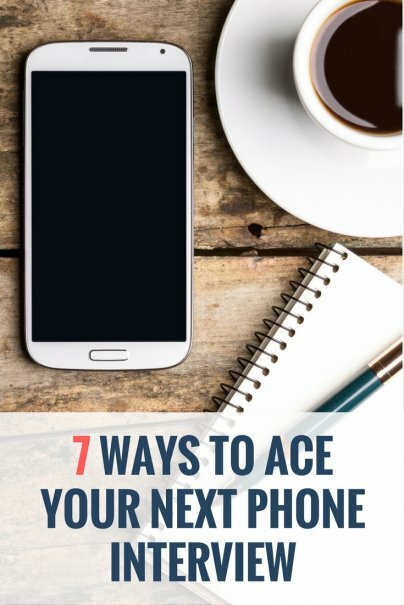 You may well think that you can jump on the phone with bed head and morning breath, but this will handicap your attitude and responsiveness from the get-go. It's imperative that you treat a phone interview with the same urgency as an in-person interview, and that means treating it with the respect it deserves. If the interview is in the morning, get up early, shower, clean up, get dressed, eat breakfast, and give yourself plenty of time to get your engine running. If the interview is in the afternoon, do not come home, slouch on the sofa, and wait for the phone to ring. Stay active. Stay alert. Have a cup of tea or coffee, and catch up on the news. Whenever your interview is, you want to come across as prepared, eager, and sharp. Anything else will put you at a disadvantage. This is another advantage of a phone interview. In person, bringing out a "cheat sheet" of questions and answers would not look good. But over the phone, you can get away with it, so you should definitely prepare this cheat sheet and use it whenever possible. Chances are, you are going to be asked the usual questions: "Why do you want to work here?" or "Where do you see yourself in five years from now?" You will also get the curveball questions, such as "What would you like to ask me about the company?" or "What is your greatest weakness?" These can be stumbling blocks, so prepare for them well in advance. This may seem like overkill, but it can iron out some issues before your actual interview. Give someone you trust the job of calling you, and provide them with some background on the company. Tell them to throw a few curve balls your way, and also ask them to pay attention to how you sound, and how your personality comes across.